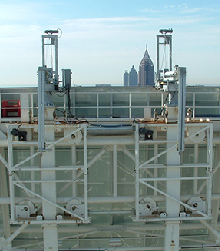 We also fabricate custom Building Roof Anchors for window washers and maintenance personnel to secure themselves while working over the side of a high-rise building. Our custom anchors for a building in Chicago were even featured on the front cover of “The Professional Window Cleaner Magazine,” the official publication of the International Window Cleaning Association. Sterling’s customized Air Handling Unit (AHU) Drain Pans are designed, fabricated and professionally installed by us, and are sure to provide years of trouble-free service. 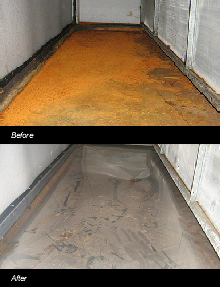 Often, AHU drain pans that have been in service for several years will deteriorate from inadequate drainage – let us minimize your costs by replacing your inner drain pan with a stainless steel pan that will not rust. Our trained service staff will remove your existing spray-in foam insulation and fit your AHU with an inner pan made of stainless steel and featuring a closed-cell insulation that is adhered to the bottom side. The result is a sealed, corrosion resistant connection from your unit to the floor drain. 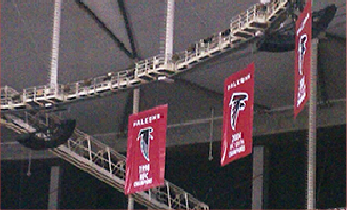 Have you been to a game or event in the Georgia Dome? Next time you’re there, take a look up. We fabricated the frames holding all of the speakers up on the aerial platform.